Enjoy the deliciousness of a peanut butter sandwich without the artificial chemicals that comes in store-bought jars. 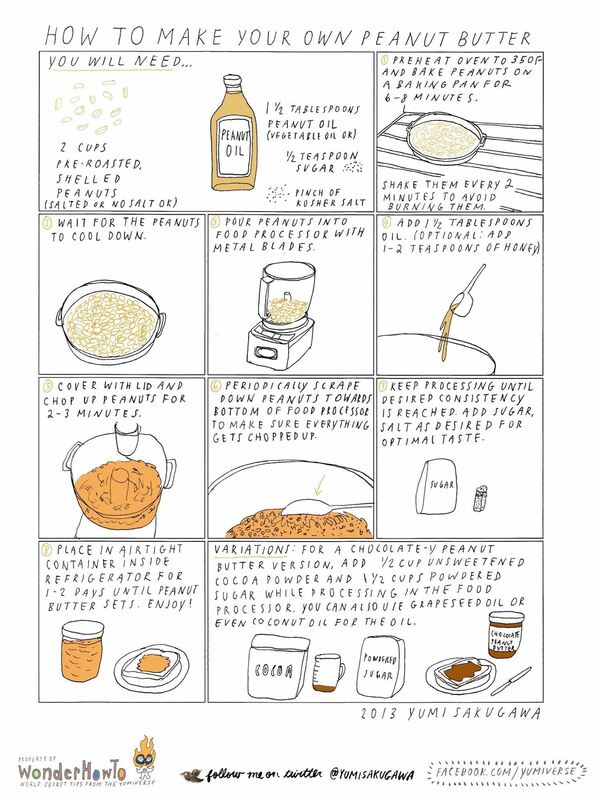 To make your own peanut butter at home, all you need are pre-roasted peanuts, peanut oil, and a little bit of salt and sugar. Roast the peanuts in the oven for about 6-8 minutes, throw them in a metal-bladed food processor, then add the oil (you can also use vegetable oil, grapeseed oil, or even coconut oil). Process until desired consistency is reached. Mix in a pinch of kosher salt and sugar, then pour the peanut butter mixture into an airtight container, which can be transferred to a refrigerator. Allow for the container to sit for 1-2 days until peanut butter takes on a thicker consistency that's perfect for spreading on toast or eating as is. For variations, you can add cocoa powder to peanuts before processing in the food processor for a more chocolate-y peanut butter concoction. Bonus: once you make your own peanut butter for your own delicious consumption, you can also use it as shaving cream, a gum remover, mouse trap bait, CD scratch fixer, and more. nice one..i m a peanut butter" lover".